Tired of looking at schematics on the Internet or printed in a magazine that you want to build but don’t even know where to start? Its time to get your projects off your valuable breadboard and make them into something more permanent. 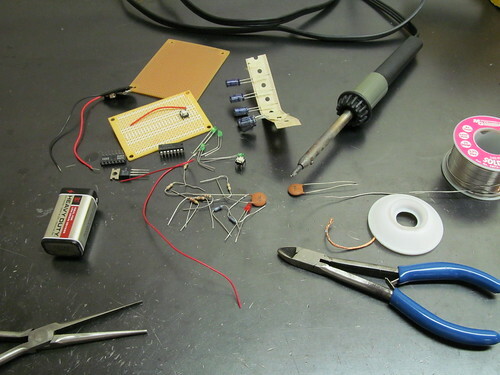 In just a few hours you can learn the fundamentals of soldering! Nothing beats being able to look at a schematic and turn it into a functional layout on a circuit board. Take your prototyping to the next level by making a durable device that can be handled and incorporated into an actual project. Here at Metrix we have enough silicon and tools to make anything your heart desires. Reserve your seat at our soldering workshop and we can show you how to solder a simple circuit that results in some cool blinking lights. Soldering is a skill that is required if you want to take our robotics workshops and some very interesting electronics based ones that we are going to have scheduled in the near future. At only $50 the workshop will fill up quick. Space is limited so be sure to call or give us a visit before the next scheduled class on August 26th at 7pm. It helps to have a small background knowledge of electronics but its not necessary. If you are interested one of our labcoats will be more than happy to talk to you about our “Introduction To Electronics” workshops and give you the head start you need. We know your up for it, all you need is yourself, steady hands and some ambition.